On March 9 high school athletes from around New England will gather to compete at the 4th Annual Ryan Moore New England Open High School Championships. The meet has previously been held at Xavarian High School but has been moved to St. John’s High School in Shrewsbury due to on-going construction at Xavarian. The meet will feature the strongest lifters from several high schools including Xavarian High School, Coyle & Cassidy High School, St. John’s High School, and Shrewsbury High School, to name a few. Entries are being accepted until February 22 and any requests for information should be directed to the meet director, Michael Zawilinski. The entry form meet packet can be found here. ELIGIBILITY: Open to ALL USAPL Junior High School and High School registered athletes 12-19 years of age who have been drug free for at least 3 years. At least 10% of the lifters will be drug tested. All athletes must have a valid USAPL Registration Card. Athletes may register at the meet prior to weigh-in. The 2014 Registration fee is $15.00 for high school seasonal (HS only division for 6 mos.) or $35 for high school full year (any meet). No qualifying totals required. CONTESTED LIFTS: Squat, Bench, and Deadlift (Full Meet) with three attempts in each. USAPL rules will govern the meet. For further clarification refer to the USAPL rulebook or consult the National Office at (260) 248-4889 or www.usapowerlifting.com. UNIFORMS: One piece lifting suits are mandatory for any contestant who enters the gear or equipped division. Shorts will be allowed for contestants who enter the raw division as long as the full knee is visible in the standing position. ALL equipment must conform to USAPL standards. This year we will also have a Raw Division which allows lifter to only wear a belt and wrist wraps; all other equipment is not allowed. 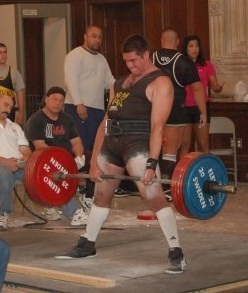 For further clarification please visit www.usapowerlifting.com or contact the meet director. WEIGHT CLASSES: Men’s 114-123-132-148-165-181-198-220-242-275-SHW. Women’s 97-104-114-123-132-148-165-181-198-SHW. There will be a Junior High/Freshman/Sophomore and Junior/Senior division in both Raw and Equipped. WEIGH-IN TIMES: All divisions will be weighed-in on Sunday between 7:30-9:00 AM. Rules briefing will follow at 9:00 AM. Times subject to change! DRUG TESTING: There will be a urinalysis test given to 10% of the entered contestants and a release form to be signed by each and every contestant competing. Failure to submit to and/or passing the drug test will result in DISQUALIFICATION. GENERAL ADMISSION: $5.00 at the door. 7:30 to 9:00 am – Weigh-in/Equipment check for ALL Jr. High/ Freshman/ Sophomore weight classes. 11:00 to 12:30 pm – Weigh-in/Equipment check for ALL Junior/ Senior weight classes.